The Jake is 20 this year, and Indians ownership has decided it’s in need of a refresh. While the ballpark was certainly a premier venue during its first decade of operation, the times have changed and the novelty has worn off. Repeating the team’s 455-game sellout streak is unlikely as the Jake is too large for today’s MLB. And there are aspects of the look and feel of the place that are very 90’s. The Indians felt it was time for a wardrobe change, if you will. Much of the effort will be focused on the outfield, where seating and circulation will be reconfigured. Gate C in center field will be opened up. Currently the gate is a fairly nondescript plaza with some young trees and little signage. Views into and out of the ballpark were obstructed. To remedy this a food court and bar in center will be removed. This is a well conceived transformation, as it’s this gate that many fans parking downtown will use (those arriving via the light rail system use Gate A in left field). The other major change, which can be seen at the top of the sketch above, is the modified upper deck in right field. The Rockies removed seats in their similar RF sections and transformed them into huge rooftop decks at Coors Field. However, unlike in Cleveland where the seating bowl will apparently remain intact, in Denver actual concrete risers were removed. The result at the Jake will be patios that will only face the field. Perhaps the Indians are doing this to preserve seating capacity for the future. Whatever the reason, it’s not as interesting as the 360-degree treatment at Coors. Bullpens will be reconfigured from their “slit” design to terraced next to the batter’s eye. The concourses will undergo their own freshening, with bright colors everywhere in the form of paint and vinyl. A kids play area will be expanded. Current capacity is 43,000. As a result of the RF changes, capacity will drop to 37-38,000. The changes should at least attract fans who haven’t been to the yard in a while, though in Cleveland, only winning will keep bringing them back. I’m glad I got a chance to visit before the Jake undergoes this facelift. if and when the a’s ever build their park here win the bay area be it sj or oak, seems like 38k-40k would be sort of the sweet spot. cisco field was initially what 32k but then you had that mlb report that said they wanted the capacity increase? @letsgoas – Yes, 36k was the reported new capacity. Problem I have with these changes is they don’t really solve the problem. The problem is those stadiums now have too many seats, particularly Coors. It would have made more sense to simply demolish the Rockpile in the off season than to fill up whole sections with what will end up being rarely used bar rails. 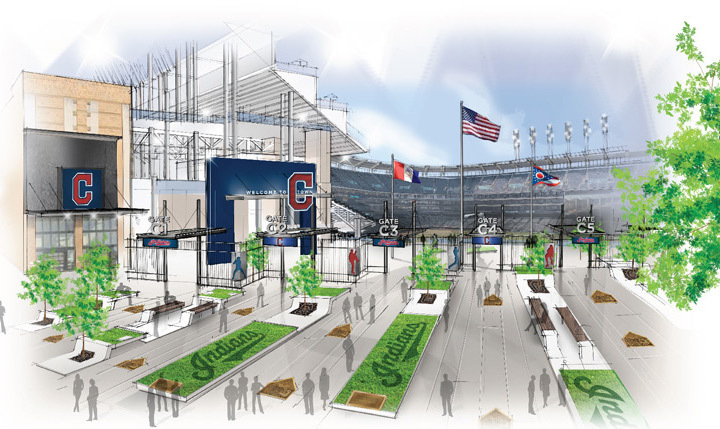 Cleveland was harder due to it being in the upper deck, but I can’t be the only one that finds their particular solution kind of unsightly. I think one thing that has become clear though is that for most teams on most days 38-40k would have been the ideal size for most ballparks, not the 42-45 that most of the new stadiums went with during the boom years of the late 90’s. Then again who knows, in a few years we may be booming again and now the 38k stadiums will have too few seats. too few isn’t really a business problem. It allows for higher ticket revenue. 1. If the A’s build this on the Coli site, they should be able to build it how they damn well please, whereas in San Jose, they would be building it in the manner that MLB allowed it to be built. 2. There’s little reason to believe attendance will skyrocket with a new stadium at the same site in Oakland. In San Jose, I think there was a chance that casual South Bay fans would become season-ticket holders in downtown San Jose. I don’t think that demographic will dramatically change their viewing behavior with a brand-new stadium in Oakland at the current site…so there’s no need to make the stadium bigger than the currently-tarped capacity. My hunch, which I’m guessing is unpopular here, is that a new A’s stadium at the same site would equal more expensive tickets with the same amount of people attending games. Which is why I don’t want the place to have 15K empty seats. I hope they learn from Cleveland and build a cool, unique 32K, two-deck stadium. Create some intimacy and exclusivity. Man with this new format I better never again hit ‘reply’ to a reply. My text is like six inches long. It looks an AthleticsNation battle between PaulThomas and Grover circa 2009.
i think 36k-38k would be ideal for an a’s park. what have been the smallest mlb parks built during this past 20 year era of new parks being built? mia’s new park that opened a couple of years ago that has a capacity of just over 37k. there are 4 new parks that have a capacity of under 40k. three other venues that were built decades ago also have less than 40k capacity. coors(col), us cell(chw), and now progressive(cle) have seen their capacity reduced. comerica(det), fenway(box), wrigley(chc), kaufmann(kc), at&t(frisco), citi(num), dogers(lad), global life(tex), and petco(sd) have increased their capacity over the years. I agree with you, I think 36-38,000 is perfect. Actually Petco’s capacity has remained largely unchanged. I think that with a new Oakland stadium, the A’s are still a 25K per night team, but with higher prices. I think those higher prices are harder to justify if there’s 10K empty seats. Only 6 teams in baseball averaging 36k or higher? I don’t think the goal is to build capacity for the average. I think the A’s in a new venue could average a bit higher then 25,000, but that’s probably not to far off. I think the goal SHOULD be to sell out every game, for years…as the Indians did. Then it becomes a streak that gets positive publicity. A streak that the entire fan base wants to keep alive. I think that multi-year sell-out attendance streak is possible if the A’s build the lowest-capacity stadium in MLB, and I think they should. I am not saying the goal should not be to sale out every game (that sounds wonderful), and Cleveland had a nice run, when they first opened their new ballpark, but if we build simply as close to an average as possible then, why stop at 32K, why not make it 24K, after all that’s the average? I don’t disagree, with most of your thinking, you say 32K (I guess that’s because it may be the minimum MLB will allow? ), and I say 36-38K, which is close enough. Umm, yeah, look how well that’s worked for Cleveland. 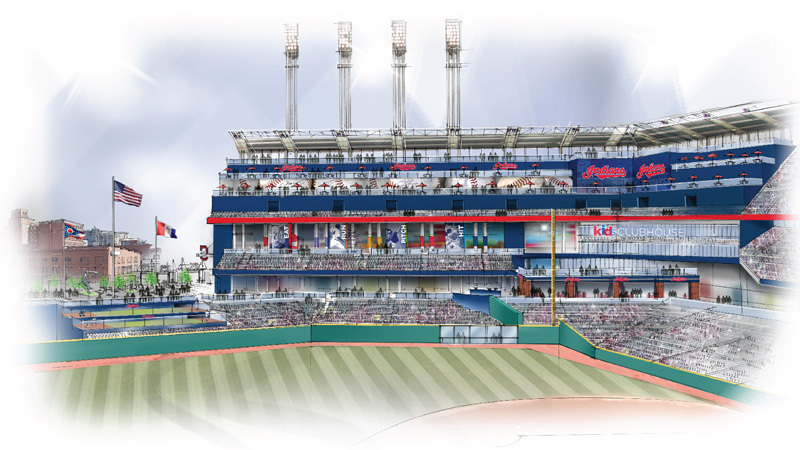 I’m thinking it would’ve been a better idea just to rip out the upper deck sections that go past the RF foul pole, and open it up to some views (then again, it’s Cleveland, maybe you don’t want a view). This looks like a lot of effort to accomplish not much.